1958 Homalopsis buccata - Taylor and Elbel, University of Kansas Science Bulletin 38:1159-1162. 1970 Homalopsis buccata nigroventralis Deuve, Serpents du Laos, p.183-185, Plate 21, Figures 1-4; Plate 22 Figs 1-3, 7. Type locality: Nam Ngum River Valley, Laos. Type specimen: None designated, and Deuve’s specimens may have been destroyed. 2006 Homalopsis nigroventralis Stuart et al. Raffles Bulletin of Zoology 54:149. The name nigroventralis is from the Latin niger for black and venter for belly. This species is readily separated from H. buccata by the dark ventral surface with light lateral spots, 35 - 39 scale rows at midbody, 10 - 13 upper labials, 14 - 17 lower labials, and 3 - 4 postoculars. Populations of H. buccata in the Mekong region have: white venters with a row of dark spots laterally, they have 40 - 45 rows of dorsal scales at midbody, 12 - 14 upper labials, 17 - 19 lower labials, and 2 postoculars. Additionally, the frontal scale on the H. nigroventralis tends to have the posterior edge fragmented, while H. buccata does not. Homalopsis nigroventralis is known from the Nam Ngum river valley of Laos, the Phu Phan Mountain region (Sakon Nakhon district and province) of Thailand, and in Cambodia in the Ta Veng and Sien Pang areas. The Thailand specimens were collected at about 550 m (Taylor and Elbel, 1958), the Cambodia specimens were collected between 100-170 m (Stuart et al., 2005). The largest specimen measured was a 1032 mm male with a 204 mm tail, the largest female was 991 mm, with a 171 mm tail that was damaged. The smallest specimen had a total length of 287 mm with a 72 mm tail. Males have tails that are 33 - 35% of the SVL; females have tails that are 27 - 32% of the SVL. 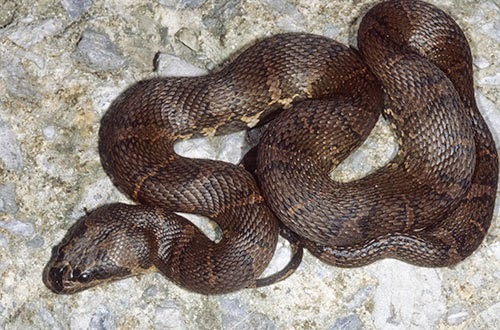 Like H. buccata, the head is slightly depressed, distinct from the neck; the area behind the angle of the jaw is puffed out giving the head a swollen appearance. The upper jaw extends over the lower jaw. The body is cylindrical and the tail is partially compressed at the base and becomes more compressed distally. The eyes are medium sized, and they are positioned more lateral than most other homalopsids. On the head the rostral scale is pentagonal and narrow, usually taller than broad. The nasal scales are semi-divided, in contact, large, and dorsal and the nasal groove contacts the first labial. The internasal is divided, and isolated from the loreal. The frontal scale is pentagonal, and is fragmented into several smaller scales at the posterior edge. The parietals are paired and shorter than the frontal in length. The loreal is usually single and contacted by upper labials 1 - 3 or 1 - 4. The ocular ring is composed of a supraocular; preoculars may number one (Thailand population) or two (Cambodia population); and postoculars can number two (Thailand population) or 3 or 4 (Cambodian population) in number. Suboculars are present and number 1 - 4, the Cambodia population tends to have one or two, while the Thailand population tends to have three or four. Temporal scales are scale like and the temporal formula is often 3 + 3 or 3 + 4, but the Cambodian population contains some individuals that have 1 + 3 or 2 + 4. Upper labials number 10 - 13, with 11 (44% of 18 sides) and 12 (44% of 18 sides) being the most frequent. The first divided upper labial is usually number six and the first few form two tiers of scales; the more posterior ones show three tiers of scales. Upper labials five and/or six are usually under the orbit. On the chin the lower labials number 14 - 17, with 16 (44% of 18 sides) and 17 (33% of 18 sides) being the most frequent. Lower labials 1 - 3 contact the first chin shield. Chin shields may number three or four pairs that are elongated. The first divided lower labial is usually number 8 - 9. Gular scales number 10 - 13. On the body the dorsal scales are strongly keeled and striated, with the usual exception of the first row that usually lacks keels and has weak striations. On the neck the rows can number from 36 - 38, at midbody the counts vary from 35 - 39, and in front of the vent the number of rows varies from 26 - 28. Ventral scale are broad counts range from 155 - 167, with three females having 155 - 160, and six males having 159 - 167. On the tail the subcaudal counts for snakes with complete tails are 67 and 78 in two females and 78 - 87 in four males. Color and Pattern. In preservative, these snakes take on a dark red-brown coloration with the typical banded pattern seen in H. buccata. However, they have an irregular cream line that runs from the angle of the mouth posteriorly along the third and fourth scale rows, this becomes broken into spots. Additionally there is a cream line from the nasal scale, below the eye, to the angle of the mouth. The occipital region has a pair of large cream spots. The ventral pattern is black-brown with lateral cream spots and some anterior transverse bars (Plate 35, Figures E and F). Bryan Stuart (personal communication) described the color in life as follows. A juvenile male (FMNH 263033) had light orange dorsal body bands, a broad tan band on the dorsal surface of head, a broken cream-white ventrolateral stripe connecting the dorsal body bands, a distinctive white X-like marking on the chin, and a black venter with scattered white spots. Three adults (FMNH 263030-32) had a brown dorsum with faint, lighter banding that disappeared posteriorly and an olive brown head with black markings on the snout and over eyes. The color of the venter was yellow-olive (FMNH 263030, male), olive (FMNH 263031, female), or olive-brown (FMNH 263032, male), darkening posteriorly to dark gray, becoming very dark gray under the tail, with cream-white spots on the ventral scales and subcaudal scales, beginning on the throat as a single spot on each ventral forming a longitudinal line, becoming more scattered posteriorly but sometimes arranged in pairs. The X-like marking on the chin was creamy-white. Stuart et al. (2005) reported this snake from gravel bottom and bedrock streams (3 - 8 m wide) transecting bamboo and mixed evergreen forest. Two specimens were collected during the day; two others were taken from a gill net. In Deuve’s (1970) original description he noted that this species and H. buccata never occurred together.